Aha. A ladder DAC. After our positive experiences with the LampizatOr Atlantic's Soekris ladder DAC, we had looked into the origins of the D/A converter category. In the beginning of digital audio, pioneer Philips used a resistor array which looked like a ladder once connected. It was not easy to build these early ladders because then it was hard to obtain resistors of sufficient precision. The result was the original TDA1541 DAC - not very accurate but much better sounding than the next generation's cheaper Delta Sigma method. Due to its passive analog process without sampling or other calculations, the concept of the ladder DAC remains far more purist than the active processing of later methods. 1. All products are hand-crafted by well-experienced technicians. Quality is first priority without sacrificing efficiency. 2. All products undergo more than 100 hours of burn-in, listening and thorough testing. 3. All components are carefully paired to obtain the finest sound. Next the company states that all their models use their "Audio-gd current signal system (ACSS) technology. Our ACCS technology transmits all audio signals in the current domain which offers the least coloured, most detailed and neutral sound." ACSS is similar to Krell's C.A.S.T. protocol, Bakoon's Satri Link and B.M.C. 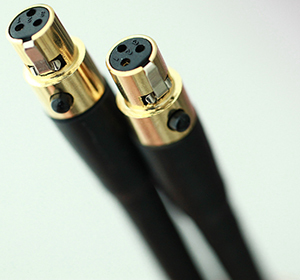 's current injection [Audio-gd's ACSS cable at left]. Mr. Qinghua already mentioned burn-in as the second line of his mantra. For today's R2R 7 model, the factory burn-in time gets stretched to 300 hours. With a catch. They advise for an additional 150 hours to mature whilst the final stage for the DAC's full sonic development really won't be hit until 1'000 hours total have passed. So a buyer only enjoys the full Monty after clocking their own 700 hours at home. That is nearly 30 days non-stop play; or 80 days with normal use. If you take this burn-in at face value or as an incremental journey towards perfection, every time you listen, things should improve for a long time; unless the process wasn't linear and happened in spurts. Either way, judge too soon and you're bound to misread.